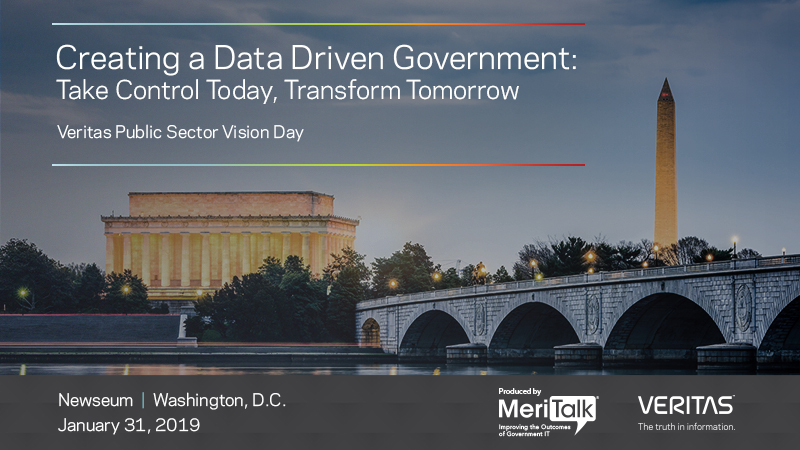 MeriTalk and Veritas’ Creating a Data Driven Government: Take Control Today, Transform Tomorrow event took place on Thursday, January 31, 2019. A packed room listened to insight from Federal cloud and data leaders from the public and private sectors, including Maria Roat, CIO, Small Business Administration; Max Everett, CIO, Department of Energy; Eileen Vidrine, Chief Data Officer, U.S. Air Force; Toby Zellers, Principle Partner Development Manager, Amazon Web Services; and many more. View the photos, coverage, and presentations from the event for key highlights below.